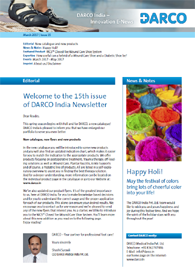 Always up to date: We invite you to subscribe to our newsletter "DARCO India Innovation E-News" free of charge. Quaterly we will inform on interesting product developments, studies, background information and special offers. You no longer wish to receive newsletters? "Friday Academicals: From idea to execution!" 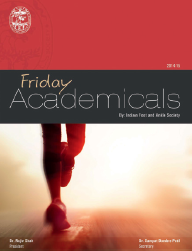 The launch of the "Friday Academicals" was featured in the 2nd issue of IFAS newsletter. 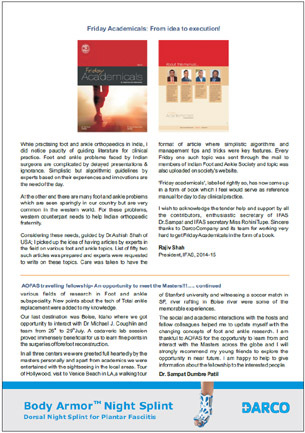 DARCO is enthusiastic and honoured to be asked to sponsor this great new book by the Indian Foot And Ankle Society (IFAS)! 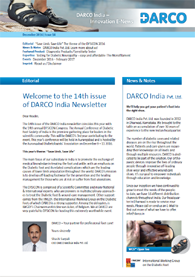 Innovation E-News: DARCO India on the spot! Please find here an overview of interesting IWGDF Education Videos. Spring is a time of planning and projects! 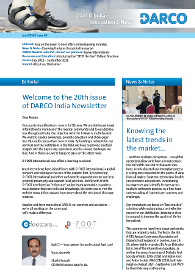 Since the first issue of DARCO India E-Journal in October 2013 much has been achieved. The team of DARCO India is now finding itself surrounded by many partners, doctors, distributors and friends. At the heart of what we aim to achieve is the establishment of Trust and Confidence. After 6 years we are proud to have established a growing number of strong and reliable distributors, networking closely with doctors and care providers across India. It's a pleasure for us to welcome you to the 23rd issue of quarterly E-News and to look forward to the year ahead as we approach Spring 2019. We have reviewed and developed a brand new catalogue and product quick view for our customers. Enjoy reading! DARCO - Your partner for professional foot care! DARCO Medical India Pvt. Ltd. is operating through a multi-facetted distribution network. Within our distribution network, we can work closely with health care providers and specialists in foot and ankle care. Spacer Associates was formed in 2017, and was the inspiration of Mr Suhaib Puzhakkal, the partner of the firm with Mr Sugathan PV. Mr Suhaib Puzhakkal being a nurse and his relationship with wound management companies makes him an expert in understanding and appreciating that the majority of wounds recur, even after the complete healing of ulcers, if improper protective footwear is worn. He also understands that the wound healing process is also quicker and more effective with proper offloading techniques and solutions being applied. The search for effective offloading concluded when they associated with DARCO. Spacer Associates established themselves as the offloading experts in Kerala with qualified support staff and relevant training which they in turn provide to our customers. Within a very short time, Spacer Associates now operates and services all cities across Kerala. You can learn more about Spacer Associates by simply calling, writing or visiting them in Changanacherry / Kerala. DARCO India Informational Material for our readers! 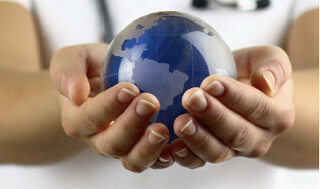 With huge potential for market growth, DARCO offers medical products of outstanding quality. Furthermore, providing personal support, long-term reliability and medical advice to our distributors. Our distributors are supported by a strong and organised sales and marketing team. In order to provide the best knowledge of our products we have developed a wide range of informative material for all categories in our product range. We have taxed our brains as to the best communication tools to inform and influence specialists in the field about our footcare solutions. At the end of the day the main A4 letter sized 36 page catalogue has proven to be undeniably an excellent vehicle, providing lots of information relating to indications, categories, sizes, measurements, accessories, fitting instructions and ordering information for our products. The 2019 updated edition is now available to show your clients. In addition, following our distributors advice, we now launch the new Product Quick View. Light weight and small in size it minimises shipping costs. 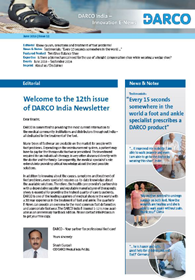 We are pleased to present our new information material to coincide with the 23rd issue of the DARCO India Innovation E-News and hope to support you in the best possible way! Please send an e-Mail or contact us directly here at our head office. please visit our rubric "Downloads". 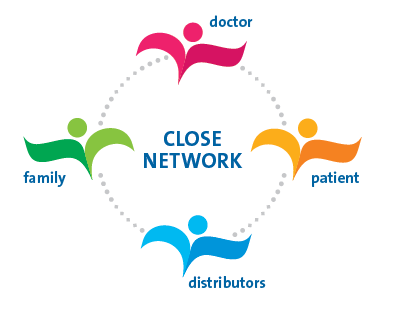 Closely knit networks between doctor, patient, family and friends and distributor is crucial for the successful treatment of injured feet. DARCO contributes more than 30 years of expertise as one of the worlds leading companies supplying orthopaedic shoes and offloading devices. However, a successful treatment is only possible if all parties involved co-operate closely in order to prevent and treat foot disorders and are dedicated to the wellbeing and needs of the patient. We reflect back on not only the past 12 months but on the many fruitful years we've had in India as a leading provider of high quality therapeutic solutions for the foot and today we are indeed more than that. DARCO Medical India has grown beyond our expectations but so too has the need for medical help across the land. 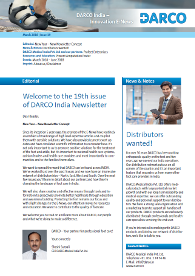 Since the first DARCO India Newsletter our Indian operations and distributorships have remained committed to broadening our reach, improving services and to providing valuable educational information. We're front and center at international conferences and trade shows; working together with professionals and organizations that improve the quality of lives of individuals. Through our collective efforts we are building a future with bright horizons and hope. Please join us in our pursuit to make a difference and 2019 will be a year of higher education, progress and a better life for many. Did you know about The DARCO India Product Videos? Read on in this issue to find out more. Back in 2013 DARCO India was at the DFSICON meeting displaying the DARCO line of products. It was at this event where we had an interesting conversation with Ms. Sampada Nayag. Her story, like so many others we hear, was an inspiration and basically at the heart of her eventual entrepreneurial venture. Shortly after that first meeting she steered her focus towards improving the lives of the people in her community. In 2010 Ms. Sampada Nayag visited her husband's outpatient clinic and left with sights she had never seen before. She saw patients with amputated feet, diabetic foot-ulcerations and individuals suffering from neuropathy. As well as feet with deformities which she quickly understood presented a great risk for further complications. After seeing their efforts to carve out custom shoes directly in the clinic for individuals, she knew there must be a better way. Shortly thereafter Ms. Nayag found herself standing in front of a DARCO booth discussing the workings of creating a distribution operation in her area. She wasted no time and launched Foot Solutions in Mangalore. Today, Foot Solutions services 4 districts around Mangalore i.e Dakshina, Shimoga, Chikmagalur and Kodagu. The company has grown steadily and is acutely focused on prevention and off-loading. The owners hold diabetic foot care awareness gatherings in and around Mangalore. Foot Solutions is also proactive in elevating awareness about off-loading and proper diabetic wound care therapies among surgeons and practitioners in the area. They now have the expertise and the know-how to service and help the people that need it. DARCO and Foot Solutions have built a solid working relationship from the ground up. We look forward to working closely together to meet the demands she will face and to support her efforts to reach the people in need. Thank you Sampada! DARCO Medical India knows that high quality products can make a difference in people's lives. But more importantly, we know that producing and distributing educational content can make a difference in people's futures. When companies or hospitals introduce new products or problem solving solutions within their organizations, they urgently need to bring colleagues and trading partners up to speed on the information. In the age of the worldwide web, many new effective ways to train and inform were launched and immediately educational videos and papers became accessible to the many people in need. It has not only revolutionized the speed in which information is transferred but also a source of inspiration for self-determination and the empowerment of the "everyman". 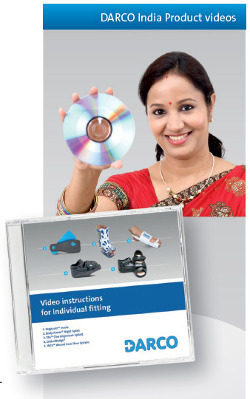 Since the beginning of DARCO India we've published educational material in the form of DVDs to improve and enhance teaching. The valuable information of how to apply and correctly use DARCO devices is readily available to Drs, nurses and practitioners across the country. If you would like to have the learning DVD, simply contact us. We will gladly send you your free DARCO DVD today. We also welcome you to visit our website and discover the DARCO India Product Videos. "Love carries the soul as the feet carry the body." "Children's Feet Need Help" is a non-profit association in Wels, Austria. The well-known orthopaedic surgeon Univ. Doz. 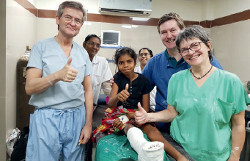 Dr. Ernst Orthner (AT) along with Veronika Gattermayr travel to India regularly to provide help to the children in need. Feet: they carry all of us through life, they give us hold and safe passage. "Children's Feet Need Help" is enabling the children of India to have a self-determined life, on their own two legs. This empowers these young individuals to participate in society. Whether it's a simple in house treatment or a surgical procedure, the organization helps keep children on their feet and moving forward. We here at DARCO are fully aware of the medical challenges many face in India and we know getting the right start for a child can make an enormous difference, one that can have an influence on their entire lives. In the spirit of the season this year we will be donating to this organization. We are proud to have the opportunity to contribute to this worthwhile non-profit. New DARCO product on board! How time flies! Here we are already with the 21st issue of the India Newsletter and this time we're proud to announce a new product to our portfolio of offerings. 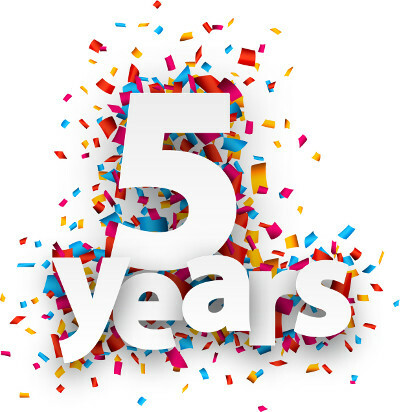 It's been over 5 years since we opened our doors for business and the progress we've made has truly been fantastic. Indeed, the needs of the foot have not changed but we're always motivated to create new and better solutions. It's our relationship with the healthcare providers and the professionals in the field that inspire our progress. The research and development continue here at DARCO in our pursuit to innovate high quality, effective products to improve the quality of life for people with foot afflictions. Mobility is a leading factor in the quality of life for any person. Whether one's suffering from disease or recovering from surgery; supporting movement and the healing process makes all the difference in the world for the individual. Body Armor® Pro Term Foot Stump Orthosis is an off-the-self interim orthotic walker for the treatment following Chopart and Lisfranc amputations. Creating a network in India poses a unique challenge purely due to its size. How can we provide the most efficient access to our orthopaedic solutions and reach the people in need? One simple answer: Through our distributors. Orthopaedic Industries established their business nearly 35 years ago with the simple goal to improve the mobility of people with disabilities through innovative products; they've been doing just that and more ever since. What was once a "one man" operation has now grown into a successful, broad based, service and manufacturing centre. Mr. Girish Dabir, Mrs. Anita Dabir and their son, Saurabh Dabir bring together specialized experience, education and commitment to the prosthetic & orthotic clinic. Orthopaedic Industries was one of DARCO India's first authorized distributors and their contribution over the years has been fantastic. With a full-fledged manufacturing unit and diagnostic capabilities they can provide innovative solutions for mobility and medical care to a wide array of people. In addition to the DARCO range of products, Orthopaedic Industries offer an extensive assortment of products and services; building relationships and rebuilding patient's confidence. Family owned and operated; two generations working together with vision and determination to pursue and explore new ways to help people. We're proud to have Orthopaedic Industries as a part of the DARCO India network and we value their ingenuity and hard work and for bringing quality and comfort to the individuals they serve. You can learn more about Orthopaedic Industries by contact us or simply call, write or even visit them in Pune. 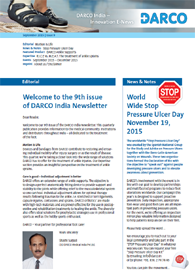 DARCO India Informational Material - for our readers! Over the years our mission and our capacity to serve has grown tremendously. We know from experience that taking the lead from science to develop the solutions can lead to better outcomes. Therefore, in addition to helping patients heal and obtain a greater quality of life, we also want to provide education and knowledge so that individuals are not only able to help themselves but also to have the empowerment to help the people they care for. 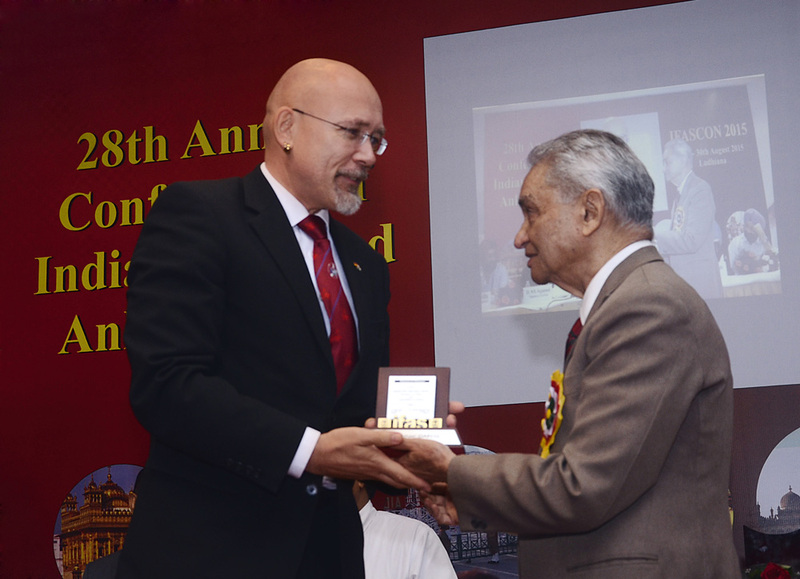 This is why the DARCO India Innovation E-News is so important to us and to our readers. From the beginning, we wanted to publish detailed, helpful information specifically for those addressing the needs of the people. Dr.s, nurses and practitioners all find value in the information. The DARCO Compendium summarizes the core information from the past 18 issues. We assembled the Expertise and the Featured Product portions of our Innovation E-News in an easy to use booklet. The whole purpose of the E-News is to give our readers a deeper knowledge of the science behind our innovations. By combining scientific facts with innovative product solutions we can elevate awareness and promote education. You can have the Compendium-Booklet today by simply contacting us. Please send an E-Mail to info@darco.in or contact us here at our head offices directly. We know this is a worthwhile booklet that will be easy to share with colleagues and partners so we must limit each query to maximum of 5 booklets. Offer good on a 'first come-first serve' basis and only while supplies last. Drop us a line and we'll send you your copy of the Compendium-Booklet free today. Medical Institutions throughout India and around the world seek to elevate awareness about the proper care for feet. Preventing plantar ulcerations and wounds is ultimately the best way to avoid amputation. Losing a limb has medical, social and economic consequences on individuals, communities and healthcare programs. Through an unrestricted grant from DARCO we are able to offer educational videos to help prevent foot ulcerations. 1) Mohammad Zubair, Abida Malik, Jamal Ahmad. Diabetic Foot Ulcer: A Review. American Journal of Internal Medicine. Videos produced by International Working Group on the Diabetic Foot (IWGDF). DARCO Medical India Pvt. Ltd., with the DARCO Europe India team come together just recently to support the 16th Annual Meeting of the Indian Society for the Diabetic Foot (DFSICON) in Hyderabad. The DARCO India subsidiary has been a contributing partner for over six years now and we are a witness to the changes taking place in the country with regard to quality of care for the diabetic patient. DARCO has steadily worked towards supporting the progress of change, by offering effective solutions to the market while setting the ground work for a solid supply chain to reach those in need. Through events like the (DFSICON) we become socially involved and can display our solutions to the scientific community. "In comparison to three years ago, the show has expanded and is more professional. I was particularly impressed by the number of companies that have significantly improved their overall appearance. There's been a noticeable investment to branding." This year, the international event connected over 700 doctors from all over India with 50 international exhibitors and we, DARCO faced many more visitors to our stand. There is a real positive trend in the country in the direction of prevention of diabetic foot ulcers and towards quality products. The professionals are exploring all possible options to make improvements in the quality of care they offer. There was an exceptional interest in our Insole systems and a definite intrigue in one of DARCO India's new additions. The Body Armor&eg; Pro Term Foot Stump Orthosisis is a post-amputation orthotic that protects the surgery and promotes better outcomes. India poses unique challenges; obstacles as climate, culture as well isolation present significate challenges but the socio-economic impact of diabetes is being felt by the people and indeed the country's government. DARCO has seen these changes and we are a leading provider of diabetes shoes and orthopedic solutions In India. The potential for DARCO in India is far from exhausted; the market continues to evolve and expand. The DARCO brand is now represented by 16 regional distributors and CEO, Prof. Shashi Surpali is confident that the number of suppliers will grow significantly over the next three years. 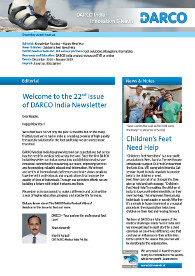 Much more work remains on the horizon for the Diabetic Foot Society of India and for DARCO but today, we are positively enthusiastic as we look back on the overall improvements that have been made across the land. It's an inspiration for everyone involved. D-FOOT international now offers e-learning modules! 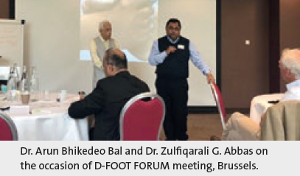 Most recently we have joined forces with D-FOOT international; a global network specializing in the care of the diabetic foot. By sponsoring D-FOOT international and other such worthy organizations we can help promote proactivity and support local activities. Jointly with UNFM, D-FOOT developed an "e-footcare" online learning module to address basic diabetic foot care skills and knowledge. We invite you to visit the website http://www.d-foot.org and learn more about the mission of this organization. Read on and learn more about DARCO, our partners and associates - we're all working on the same goal. Let's make a difference. In India, we face a special challenge in caring for the foot across this enormous area of land. How best can we provide the education and services? One simple answer: Through our distributors. Cultural norms often influence how society treats and deals with the needs of the people for medical care. Protecting people's feet and getting the information out to those who need it are just two of the primary objectives. We here at DARCO India, want to support wound management organisations and health care facilities to provide quality foot care solutions to help make a difference in a still ever growing, worldwide health care problem. We make quality footwear and make it available for as many people in need as possible throughout the world. Revive International was founded in 2012 with a vision and a commitment to pledge their resources to offer practical solutions and provide education for the treatment and prevention of diabetic and traumatic foot ulcers. Revive has built of team of enthusiastic professionals dedicated to servicing the community and upholding the highest of ethical standards. Their offerings range from footwear specifically designed to control plantar pressure on the foot to providing education and community support throughout their region. Revive carries the complete DARCO India product range and have proven through their resourcefulness and dedication that they are truly a member of the DARCO family. DARCO Medical India Pvt. Ltd. knows that with the right products coupled with good service and proper education, we can make a difference. Our Innovations are backed by years of experience and scientific knowledge. Sure, we want to help every individual to proactively make the right decision but we also want to provide knowledge so people can help themselves as well as help the people they care for. This is why the DARCO E-News is an important part of our efforts. Through the publication we can inform Dr.s, nurses and practitioners with valuable information on caring for the feet, and just how important proper management and footwear is for prevention and healing. Heel spurs and heel pain - Why? Heel pain is among the most frequent types of pain occurring in the foot. In general, the pain is caused by overstressing the plantar fascia. Due to overuse, the connection of the plantar fascia at the calcaneus can get inflamed which is also known as plantar fasciitis. Nearly 10% of the population suffer from either heel spurs or plantar fasciitis. Treatment options for plantar fasciitis include rest, massage therapy, stretching, weight loss, night splints, proper shoes and physical therapy. If not treated properly and effectively, a plantar fasciitis case can result in the development of a heel spur. Find out more about this and how to treat through this handy brochure now available to you free of charge. Just simple contact our office and we'll be happy to send you one today! please visit our rubric "Downloads"
... and from multiple perceptions... Our global operations allow us to have a broad perspective on health care and orthopaedic solutions. A critical part of our innovative process is taking into consideration the points of view from all angles: Surgeons, technicians, health care providers and patients. Participating in congresses and scientific lectures across multiple continents provides us a first-hand understanding of 'patient care' concerns and challenges. Our innovations are based on "best practice" solutions while maintaining a cost-effective means for our distributors; keeping us close to our goal to improve the quality of life for the patient. 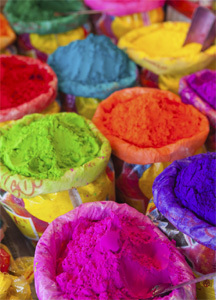 This summer we have three important events that are related to India. The first is the 4th A-DFS Annual Conference (Association of Diabetic Foot Surgeons) in London, June 28- 29, where highly respected Dr. Arun Bhikedeo Bal is one of the international speakers, as well as the annual meetings of Diabetic Foot Society of India, (DFSI 2018) and Indian Foot and Ankle Society (IFASCON 2018), both taking place August 31st - September 2nd. We'll be there listening and learning. Since its inception 5 years ago, the creators of the E-News have routinely assembled a broad range of high level expertise articles and coupled them with sensible solutions. We have also provided current event updates and have circulated scientific information to our reader base. It's not only important to us to promote positive solutions for the treatment of the foot and ankle, but it's important to national health care systems, opinion leaders and health care providers and most importantly to communities and to the families themselves. We want to spread the word that DARCO can be found across INDIA. We've worked hard over the past 5 years and we now have an impressive network of distributorships - North, East, West and South. Over the next few issues you'll learn in detail about our partners and how they're changing the landscape of foot care in India. We will also share creative and effective means through tools and information to proactively promote better healthcare through education and awareness building. Protecting the feet remains our focus and with slight changes to the E-News, our attention moves to resources and education. We want to contribute to the quality of footcare. We welcome you to read on and learn more about DARCO, our people and what we're doing to make a difference. For over 30 years DARCO has been putting orthopaedic quality on the feet and five years ago we opened our India operations. Our distribution network puts us on all corners of the country and it's an important feature that separates us from many other foot care providers in India. DARCO Medical India Pvt. Ltd. off ers medical products with large potential market growth and with our long-term reliability and medical expertise; we can off er outstanding quality and personal support to our distributors. We have a strong sales organisation and a marketing team to support all handlers of our products. DARCO products are exclusively distributed through professionals and healthcare specialists servicing the end user. If you're interested in working with DARCO products and joining our network of distributors, we'd like to talk to you. In India, we face a special challenge in caring for feet. Not only is it an enormous area of land to service but in general the movement of information and help maybe sometimes be slow. With respect for cultural norms, most people don't wear protective shoes and economic challenges and literacy rates compound the issue. This puts many feet at risk. We here at DARCO India, want to support wound management organisations and health care facilities to provide quality foot care solutions and valuable information. The supply chain and network we build support our desire to make foot care available for as many people in need as possible. Profeet Enterprises is committed to helping people in need. The organization has been a loyal member of DARCO's India network since the beginning and we're proud to be working this dynamic and dedicated group of young professionals. Profeet Enterprises specialises in high quality foot wear solutions through design and on hand, combating the detrimental effects of diabetic foot syndrome. "The shoe must fit the foot rather than the foot fitting the shoe." Profeet elevates our brand and message throughout their work by offering the complete DARCO India's range of solutions and through the disbursement of knowledge and education. Their ingenuity and hard work is an inspiration to DARCO worldwide and we're proud to present them as one of our distributors. DARCO Medical India Pvt. Ltd. knows that with the right products, good service and proper education, we can make a diff erence. Our innovative range of products are backed by years of development experience and supported by scientific knowledge. We not only want to help the individual make the right decision but also to empower proactivity in every man to seek the optimal care for the foot. It remains our goal with the E-News to seek the best possible ways to inform Dr.s, nurses and practitioners on the importance of caring for the diabetic foot. Therefore, we will offer tools for implementation that will support the message that footwear is the most important part of management for prevention and healing. This simple and easy to relate to, wall poster is direct. Prevention is the key element to avoiding amputation and it points to proper shoe wear as being the most important step in the process, and there's a clever solution from DARCO. Wherever the topic of amputation and diabetic patient foot care is discussed, the poster will fit. It can educate patients and their families and hopefully empower people in the waiting rooms, clinics and hospitals, to understand that the preventative approach is the best solution against amputation. DARCO India is off ering the "Prevent Amputation" Poster free of charge to anyone. You can have posters just by contacting us directly. Tell a friend who may need the poster and we will gladly honour all requests. Since our inception, DARCO has been dedicated to the development of high quality products to improve the lives of people - people from all walks of life. Our research and development has never been a solitary pursuit. Through our commitment to collaborate with technicians and industrial designers we can innovate new philosophies in foot care while shifting the mind-set of leading medical professional and physiotherapists alike. Creating new products using state-of-the-art technology allows us to better meet the needs of the people and the countries that serve them. 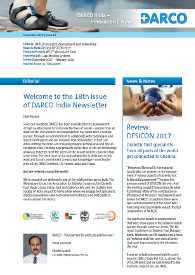 The 18th issue of our India Newsletter is dedicated to this work and to our commitment to exchange knowledge - cross border with all the DARCO entities; US, Europe, India and China. And we network around the world! We're proud of our philosophy and of the relationships we've built. The Woundcare-Circle, the Association for Diabetic Surgeons, the Diabetic Foot Study Group, Indian Foot and Ankle Society and the Diabetic Foot Society of India are just to name a few where we engage foot specialists, medical associations and biomechanical institutes and participate in events all over the world. "Renowned National & International faculty who are pioneers in the management of various aspects of Diabetic foot & Wound Management" This was the announcement of DFSICON this year. And the meeting brought forward exactly what it promised. Many of the contributors in attendance at this year's meeting were well known to DARCO. In addition, there were two German members of the board who have long since been highly valued, trusted collaborators of DARCOs. 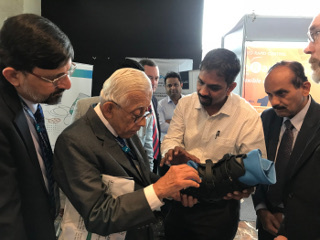 The depth and breath of advancements that were show cased in the Indian research worked through numerous levels; The National Guidelines on Diabetic Foot Management, Workshops on Off -loading and a focus on Footwear and Foot care were all areas that more than impressed the attendees this year. It was an enlightening worthwhile experience for DARCO India Pvt. Ltd. to attend the DFSICON event and we look forward to the next one. Hope to see you there. The destination is one thing. The 17th issue of our India Newsletter is timed perfectly this quarter to recognize our anniversary and the independence of a country. Many months have passed since the "ribbon ceremony" at our India headquarters in Dharwad, but our goal has remained the same - to serve the people of India. DARCO India is proud to bring the message home through our distributors, our website, the newsletter, and most importantly, through the spoken word. Since our inception we have attended many trade shows and participated in many events. At the end of the day, it's communication which brings us closer to our customers and to the people whom, through our products, can realize an improvement in the quality of their lives. It's the spread of information and knowledge that make the difference to a community. Our distribution network in India is growing and our activities on the international stage contribute to that growth. We face people from all over the world at trade shows like Africa Health or Arab Health. Through these events, we know there is a demand for DARCO products among foot care specialists everywhere and especially in India. We know the needs are great and reaching the people has been our greatest challenge in the undertaking. We remain dedicated to the people of India and look forward to the years to come. 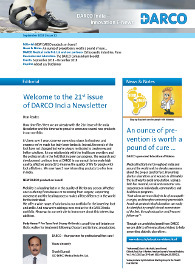 Please accept our gracious thanks for your interest and support in this quarterly publication and in DARCO India. What's in store for you this time? An oldie, but goody! Learn more about the DARCO HeelWedge™ off-loading shoe. DARCO Medical India Pvt. Ltd. celebrates its 5th anniversary! Five years ago we started the DARCO Medical India operations and although still in its infancy, the undertaking has been challenging but also successful. DARCO International, now in its 30 years of operations has become one of the world's leading providers of orthopedic foot and ankle products. The European operations have now been running strong for over 20 years and are very instrumental in the event planning for the Indian subsidiary. We are all celebrating with DARCO Medical India Pvt. Ltd. for their successes this month and we're well aware that the international exchange fortifies our worldwide vision as well as elevating the product quality and the standards of service. We wish to say thank you - Thank you, to all of our esteemed customers whom over the years have trusted in our vision and in our products! Download Flyer (PDF): "Your partner for foot care celebrates its 5th anniversary!" Our 16th issue of the India Newsletter is dedicated to the little people in our lives. Our pediatric products may not generate big sales, but are certain to create big smiles. We all know how active children are and how difficult it may be to keep them still in times of recovery. Plaster casts are not only cumbersome but also difficult to tolerate. This is why a simple, but effective orthopedic shoe can make all the difference in the world to your young patient. Whether it's post-surgical or a plaster cast, DARCO has the right shoe for your every patient. DARCO is a trusted partner for developing orthopedic shoes for foot and ankle injuries and integrates more than 30 years of experience into every shoe we make. We know how biomechanical effects can influence the entire healing process and just how important this phase is to ensure long-term success. From the small active child to the fully grown - DARCO offers quality, reliable products that are adaptable to the needs of all patients. 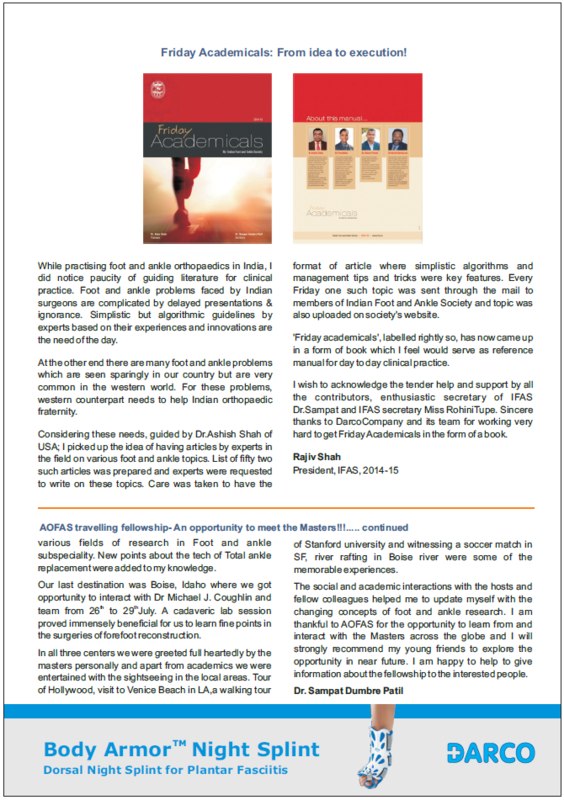 Please click on the PDF-file on the top right to open the current India Newsletter and you'll learn how we can help with that one particular patient, who may actually be the most demanding. H. Darrel Darby, DPM, founded DARCO International in 1985. Over 30 years ago, Dr. Darby was a practicing Podiatrist searching for a better solution to help his patients. At the time, the "woodensole" healing shoe dominated the market, and the "Darby" shoe revolutionized the industry. It was Dr. Darby's belief that by incorporating the benefits of a running style of shoe with the technology of a post op shoe, he could dramatically improve the quality of care for his patients. Hence, the DARCO MedSurg Shoe was born. Today, DARCO International provides funding to the Podiatric Medical Education Association for scholarships. Podiatry or podiatric medicine is a branch of medicine devoted to the study, diagnosis, and medical treatment of disorders of the foot, ankle and lower extremity. Very often the work includes actual surgical procedures and it's quite common for Podiatrists to hold the professional title of "Doctor". The term Podiatry came into use in the early 20th century in the United States and now is used worldwide, including the UK, India, Australia and many countries throughout Europe. In India, Podiatry has remained mainly "non-surgical". Due to the growing emphasis on treating the diabetic foot, the need for skilled individuals is on the rise. Practitioners are pushed to re-invent their role as allied health professionals in foot care. Professionals stepping up their game as the needs of the people dictate. This spring season begins with Holi and for DARCO, a new catalogue! DARCO India is pleased to inform you that we have enlarged our portfolio to serve you even better. In the new catalogue you will be introduced to some new products and you will also find an updated indication chart, which makes it easier for you to match the indication to the appropriate products. 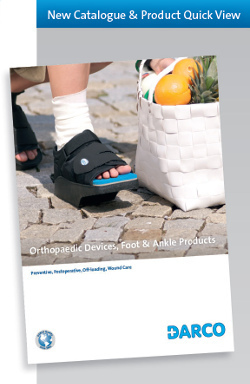 We offer products focusing on postoperative treatment, Trauma therapy, Off-loading solutions as well as Wound Care, Plantar Fasciitis, Ankle Supports and of course, a Pediatric line of products. All are listed in a self-explanatory overview to assist you in finding the best therapy solution. And for a deeper understanding, more information can be located on the individual product page in the catalogue or on our websites. We've also updated our product flyers. It's of the greatest importance to us, here at DARCO India, for you to make knowledge based decisions and for you to understand the correct usage and the proper application for each of our products. This alone can ensure your desired results. We encourage you to contact us for any reason and we're pleased to send any of the new flyers that interest you. As a starter, we'd like to introduce you to the WCS™ Closed Toe Wound Care Shoe System. You'll learn more about this new addition as you read on to the following page. cheerful color into your life! The DARCO India Pvt. Ltd. team would like to wish you and yours happiness and joy during this festive time. And we hope the spirit of the holiday stays with you throughout the year! 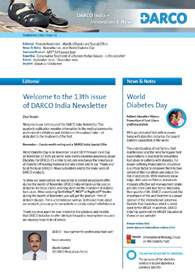 This year's theme: "Save Limb, Save Life"
The 14th issue of the DARCO India newsletter coincides this year with the 14th annual DFSICON Congress. The Annual Conference of Diabetic Foot Society of India is the premiere gathering place for leaders in the scientific community. This will be DARCO's 3rd year contributing to the event. This year's conference will be held in Aurangabad and is hosted by the Aurangabad Diabetologists' Association on December 9 - 11 2016. The main focus of our subsidiary in India is to promote the exchange of medical knowledge in treating the foot and ankle; with an emphasis on the Diabetic foot and its related complications which are the leading causes of lower limb amputation throughout the world. DARCO's mission is to develop off-loading footwear for the prevention and the healing management for those who are at risk or suffer from foot ulcerations. The DFSICON is comprised of a Scientific Committee and many National & International experts, who are pioneers in multidisciplinary approaches to treat the Diabetic foot & wound-care management. Other support comes from the IWGDF; the International Working Group on the Diabetic Foot; of which DARCO is a strong supporter. Among the delegates, is IWGDF's Chairwoman Kristine van Acker, of Belgium. We at DARCO are very grateful to DFSICON for hosting this extremely worthwhile event. DARCO India Pvt. Ltd. was founded in 2012 in Dharwad, Karnataka. We brought to the table an accumulation of over 30 years of experience to the new Indian headquarter. The number of diabetic cases and related diseases are on the rise throughout the world. Patients and care-givers are expanding their knowledge on all levels and through multiple resources. DARCO is dedicated to be part of the solution. Our orthopaedic devices improve the lives of ordinary people through innovative off-loading shoe-wear and effective wound care shoes. It's our goal to empower individuals through education and knowledge. Since our inception we have continued to grow to meet the needs of the people; to date, we have 16 different distribution channels throughout India. Our headquarter in Dharwad is ready to service your needs. 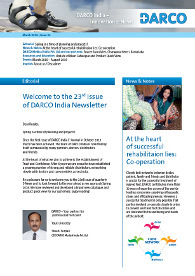 Welcome to our 13th issue of the DARCO India Newsletter. This quarterly publication provides information to the medical community, professional institutions and distributors throughout India - all dedicated to the treatment of the foot. World Diabetes Day is on November 14 and STOP Pressure Ulcer Day on November 17 both are world-wide events elevating awareness about Diabetes. For DARCO, it's a time to not only emphasize the importance of Diabetic Off-loading footwear but also a time to say "Thank you" to all the loyal DARCO E-News subscribers and to the many users of DARCO products. To show our appreciation, we would like to extend an exclusive offer during the month of November. DARCO India will pick-up the cost on deliveries for those clients ordering shoes for the treatment of diabetic foot ulcers. When ordering GentleStep™, WCS™ or PegAssist™ Insoles during the month of November, you will get the product - free of delivery charges. This is a tremendous savings. To find out more about our products simply contact info@darco.in. Thank you once again for your interest in the solutions and insights that DARCO India has to offer. We look forward to hearing from you and we sincerely hope to be of service. With an estimated 50.8 million people living with diabetes; India has the largest diabetes population in the world. The understanding of risk factors, foot maintenance and the need for regular foot examinations is essential for preventing foot ulcers in patients with diabetes. For people suffering from diabetes, education is a critical factor to empower them to take control of their condition and reduce the risk of ulcerations. With improved knowledge, skills and confidence, individuals integrate effective self-management strategies into their daily lives hence improving their quality of life. DARCO understands the importance of this and therefore is a proud sponsor of the International Consensus Diabetic Foot Guidelines which is developed by the IWGDF. In addition, DARCO India has published the IWGDF Educational Videos on our website! DARCO is committed to providing the most current information to the medical community, institutions and distributors throughout India - all dedicated to the treatment of the foot. Many types of footwear are available on the market for people with foot problems. Depending on the reimbursement system, a patient may have to pay for the therapeutic footwear prescribed. The investment required for an individual's therapy, is very often discussed directly with the doctor and the family. Consequently, the medical specialist's role extends into providing critical knowledge about the best possible solutions. In addition to knowing about the causes, symptoms and treatment of foot problems, every specialist requires up-to-date knowledge about the available solutions. Therefore, the health care provider's partnership with a dependable supplier and reputable manufacturer of therapeutic shoes is essential for providing the highest quality of care to patients. DARCO is one of the leading suppliers of medical shoes in the world with 30 years of experience in the treatment of foot and ankle. The quarterly E-News can provide an overview to the most common foot deformities and appropriate footwear. The DARCO India E-Journal 1 - 12 is now available as a complete set. Please contact info@darco.in to get your free copy. 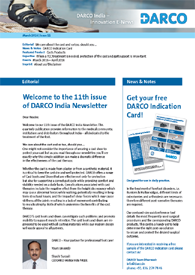 Welcome to our 11th issue of the DARCO India Newsletter. This quarterly publication provides information to the medical community, institutions and distributors throughout India - all dedicated to the treatment of the foot. One might not consider the importance of wearing a cast shoe to protect your cast but as you read through our newsletter, you'll see exactly why this simple addition can make a dramatic difference in the effectiveness of the cast therapy. Whether the cast is made from plaster or from a synthetic material, it is critical to keep the cast dry and well protected. DARCO offers a range of Cast boots and Shoes that are effective not only for protection but also for supporting a correct gait cycle while providing comfort and stability needed on a daily basis. Complications associated with cast therapies include the negative effect from the height discrepancy which may cause abnormal forces while walking; potentially resulting in longterm structural issues, and the impact of shear forces which may cause stiffness of the joints resulting in a lack of movement contributing to muscle atrophy. Both of which undermine the benefits of the cast therapy. DARCO's cast boots and shoes can mitigate such problems and promote mobility to support muscle retention. The cast boots and shoes are engineered to be used with all casting materials while our modern design will easily appeal to all patients. In the treatment of forefoot disorders, i.e. Bunions & Hallux valgus, different kinds of osteotomies and arthrodesis are necessary; therefore different post-operative therapies are required. 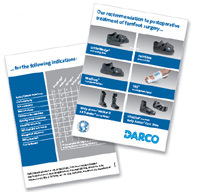 Our postcard-size quick reference tool details the most frequently used surgical procedures and the corresponding DARCO products. This card is a handy aid to help determine the right post-op solution to secure and protect the desired surgical outcome. If you are interested in receiving free DARCO indications cards please contact us! 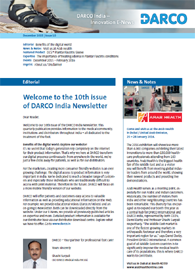 Welcome to our 10th issue of the DARCO India Newsletter. This quarterly publication provides information to the medical community, institutions and distributors throughout India - all dedicated to the treatment of the foot. It's no secret that today's generation rely completely on the Internet for their product information. That's why we here at DARCO transform our digital presence continuously. From anywhere in the world, we're just a few clicks away for patients, as well as for our distributors. For the marketers, creating more consumer friendly websites is an ever growing challenge. The digital access to product information is very important in India. We're dedicated to reach a broader range of customers and especially those individuals who are traditionally difficult to access with print material. Therefore in the future, DARCO will focus on a more mobile friendly version of our website. DARCO will offer patients and customers easy access to valuable information as well as providing educational information on the Web. For example, we provide educational videos and an on-going E-Newsletter; both can be downloaded directly from the website. 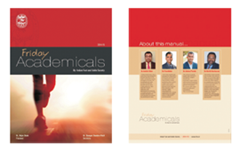 Under our E-News, we provide all previously published articles on expertise and more. Detailed product information is available for our distributor base via our distributor download centre. Explore what we have to offer. The 2016 exhibition will showcase more than 4,000 companies exhibiting their latest innovations to more than 130,000 healthcare professionals attending from 163 countries. Arab Health is the biggest health fair of the Middle East and as a visitor you will benefit from meeting global industry leaders from around the world, showing their newest products and providing live demonstrations. Arab Health serves as a meeting point, especially for our Arabic and Indian customers. Historically, the number of visitors from India and other neighbouring countries has been remarkable. This diversity has encouraged us to expand our booth this year as a central hub for DARCO International and DARCO India, represented by both CEO's; Darrel Darby and Professor Shashi Surpali respectively. "The Middle East market is one of the fastest growing markets in orthopaedic footwear and therefore a very important region for us," says Darrel Darby, President DARCO International. A common goal of all Middle Eastern countries is to significantly improve the medical health care of its populations; this is where DARCO wants to contribute. Visit us in Dubai at Booth 4D70! The partnership between the Indian Association for Foot Surgery and DARCO is based on the commitment to strengthen the knowledge of foot surgery. For 30 years, DARCO is actively contributing to the exchange of knowledge between specialists. All with one common goal, to improve the timely healing of foot injuries with high quality products. Dr. Rajiv Shah, President, IFAS, 2014-2015 and Alexandra Panizza, International Marketing, DARCO (Europe) both appearing here at the presentation of the "Friday Academicals" at the Indian Foot & Ankle Conference 2015, Ludhiana. Here appearing at the Indian Foot & Ankle Conference 2015 is Professor Prof. S. M. Tuli, Past President of Indian Orthopedic Association and Raphael Böhm, VP DARCO (Europe) at the awards ceremony in Ludhiana. 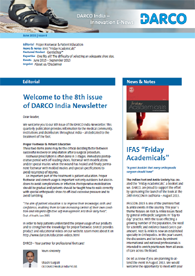 Welcome to our 9th issue of the DARCO India Newsletter. This quarterly publication provides information to the medical community, institutions and distributors throughout India - all dedicated to the treatment of the foot. Devices and bandages from DARCO contribute to restoring and ensur- ing individual mobility after injury, surgery or as the result of disease. This quarter, we're taking a closer look into the wide range of solutions DARCO has to offer for the treatment of ankle injuries. Our Expertise section provides an insightful perspective on the treatment of ankle sprains. DARCO offers an extensive range of ankle supports. The objective is to design a perfect anatomically fitting device to provide support and stability to the joints while offering relief to the musculoskeletal system so one can heal. Individual adjustment allows for optimal therapy results following traumas to the ankle, i.e. stretched or torn ligaments, capsule injuries, contusions and sprains. DARCO orthotics' are made with high-tech materials and are proven effective for the use in postoperative and rehabilitation treatments to healing the ankle. The diversity also offers ideal solutions for prophylactic strategies use in professional sports as well as the hobby sports enthusiast. The worldwide "Stop Pressure Ulcer Day" was created by the Spanish National Group for the Study and Advice on Pressure Ulcers together with the Ibero-Latin-American Society on Wounds. These two organizations formed the Declaration of Rio with the objective to "speak out" against people developing pressure ulcers and to elevate awareness about prevention. DARCO's involvement with the event is in line with our goal to develop partnerships and multifaceted programs to reduce foot ulcerations worldwide. Our campaign this year's is designed to support proactive prevention. Daily inspection, appropriate foot-wear and good foot care are all important parts in preventing pressure ulcers. For the event, we're offering an inspection mirror plus valuable information designed to help patients keep an eye on their feet. 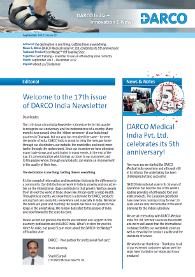 Welcome to DARCO India Innovation E-News! 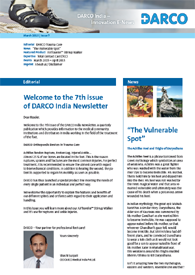 We welcome you to our 8th issue of the DARCO India Newsletter. This quarterly publication provides information to the medical community, institutions and distributors throughout India - all dedicated to the treatment of the foot. These two items alone may be the critical deciding factor between successful recovery or amputation after a surgical procedure. Footwear prescription is often done in 3 stages. Immediate postoperative period with off-loading shoes, footwear with modifications and/or special insoles when the wound has healed and finally permanent footwear with molded insoles and special specifications to avoid recurrence of injuries. An important part of the treatment is patient education. Proper footwear and correct usage is important not only outdoors but also indoors to avoid complications or infection. Postoperative mobilization should be gradual and patients should be taught how to walk correctly with special orthopaedic shoes to off-load excessive pressure and to avoid tumbling. "The aim of patient education is to improve their knowledge, skills and confidence, enabling them to take increasing control of their own condition and integrate effective self-management into their daily lives" - Dept. of Health, June 2005. In order to help patients understand the proper usage of our products and to strengthen the knowledge for proper footwear, we provide product videos and educational videos. 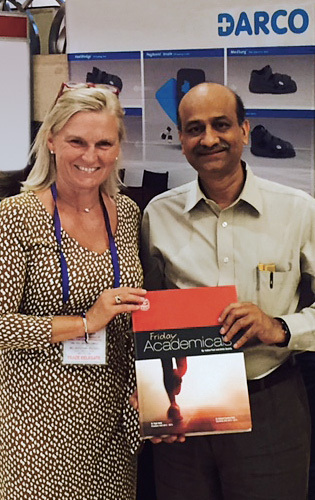 "A great booklet that every orthopaedic surgeon should have"
The Indian Foot And Ankle Society has created the "Friday Academicals", a booklet and we, DARCO, are proud to support the effort by sponsoring the launch of the book at the 28th IFASCON in Ludhiana - August 2015. IFASCON-2015 is one of the premiere foot & ankle events in the country. This year´s theme focuses on Foot & Ankle issues faced by general orthopedic surgeons in "day to day" practice. With the issue effecting a growing number of the population, the need for scientific and evidence based care is paramount. Foot & Ankle is now an established specialty in Orthopedics. In this year's event, the discussions and lectures by eminent international and national professionals is intended to enrich practioners from all areas of care across the board. Do let us know if you are planning to at- tend the event in August 2015. We would welcome the opportunity to meet with you! 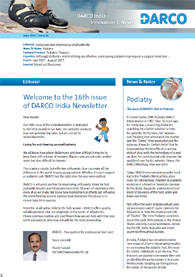 Welcome to the 7th issue of the DARCO India Newsletter, a quarterly publication which provides information to the medical community, institutions and distributors in India working in the field of the treatment of the foot. Almost 25 % of our bones are located in the feet. This is the reason ruptures, sprains and fractures are the most common injuries. For perfect treatment, it is recommended to ensure the utmost care with regard to biomechanical conditions. In addition to healing the wound, the patient is supported to regain his mobility as soon as possible. DARCO has thus launched a special product line meeting the needs of every single patient in an individual and perfect way. 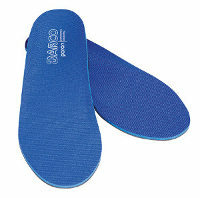 orthotics with regard to their application and handling. In this issue you will learn more about our AirTraveler™ Stirrup Walker and it's use for ruptures and ankle injuries. Achilles heel is a well-known synonym from Greek mythology symbolizing an area of weakness. In Greek mythology a story is told of Achilles. When he was a small child his mother Thetis dipped him in the river Styx. The water was believed to be magical offering power of invulnerability. But as the mother was holding her son by his heel, this area remained vulnerable. Achilles grew up and survived many battles, but finally a poisonous arrow wounded his heel and he died. Indian mythology tells us of a similar story. The mother of Duryodhana, Queen Gand- hari, wanted to help her son be a winner. She asked him to appear naked before her. With the great power of her eyes she could make the exposed body invincible. But Shiri Krishna convinced Durodhana to wear a loin cloth, as it wouldn't be good for a son to appear naked before his mother. Because Duryodhana had covered his groin, his thighs where not protected by the mystic power of Gandahari's gaze. This area of weakness was the cause of his untimely death by Bheem / Bhima. 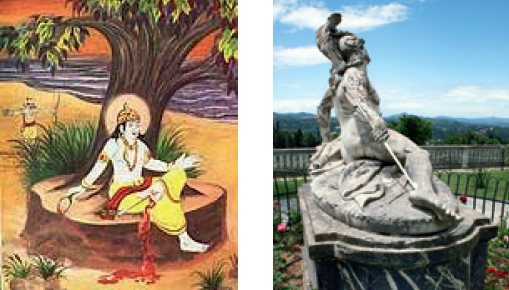 Isn't it amazing how the two mythologies, eastern and western, resemble one another?